RUDN chemists have developed a hybrid nanocatalyst for quick removal of stable organic dyes from wastewater. This catalyst does not require additional aggressive solvents. The results of the study were published in Inorganic Chemistry. Industrial dying of plastics, fabrics and other materials requires toxic organic dyes that are dangerous for humans and the environment in the long run. So ecologists try to remove residual dyes from plant wastewater. For example, using coagulants can speed up the sedimentation of dye particles, but this causes water to silt up. Water purification with ozone prevents this, but the technology is expensive. RUDN chemists, together with their colleagues from China, Pakistan, and Portugal, now suggest a cheaper and more eco-friendly technique of water purification. 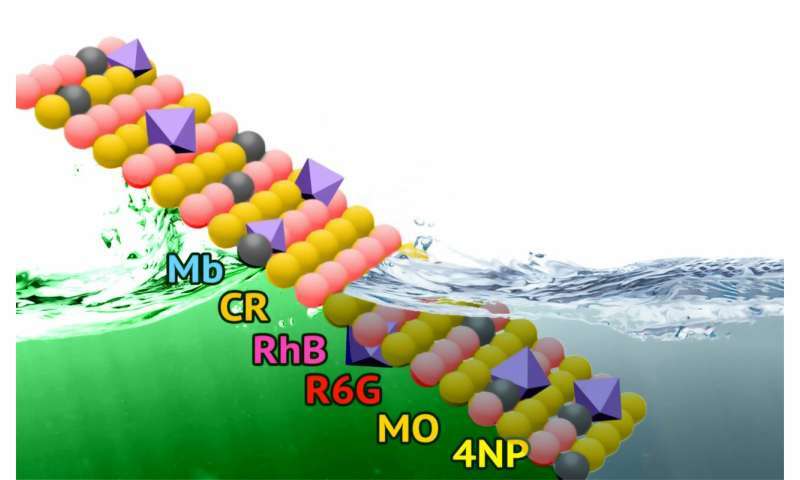 The researchers introduced a purifying hybrid nanomaterial—a grid containing metal atoms and organic molecules. Such structures were used as catalysts. The second component of the new nanomaterial was a base made of layered double hydroxides. The two parts self-organize and form a single flat nanostructure. The main feature of this material lies in its unusual structure—it is porous and crystalline at the same time, and it is also strong. The RUDN chemists gave a detailed description of the whole synthesis process and then tested the new material as a catalyst for wastewater purification from organic dyes. Such organic dyes as methylene blue, congo red, methyl orange and others were used in the experiment. The hybrid nanogrid was able to purify a water solution from the dyes quickly: Methyl orange was deactivated in just one minute, and a stable fluorescent dye called rhodamine 6G neutralized in several minutes. Moreover, the new material does not lose its properties after the first use and may be used up to five times without any quality decrease. "Our development would stimulate the creation of new nanomaterials with improved functional properties and wide areas of use in green chemistry. We are going to continue our studies and hope to obtain nanomaterials to remove other contaminants in the future," said Alexander Kirillov, a co-author of the work, Ph.D. in chemistry, and an associate of the Joint Institute for Chemical Studies at RUDN.